In this Thursday Therapy Glenn answers some follow up questions on tapping for weight management. 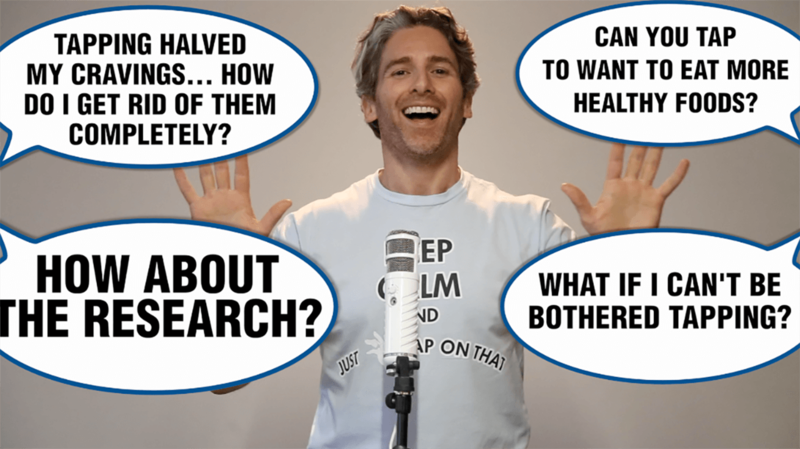 The questions are from people who know about tapping, and include “can I use tapping to want to eat healthier foods”, “what do I do if sweet cravings keep coming back”, and “how do I deal with the rebellious part that doesn’t want to tap?” Glenn finishes inviting you to join our ONLINE TAPPING FOR WEIGHT MANAGEMENT PROGRAM! Hi everyone, it’s Glenn Mackintosh, the weight psych, and today we’re answering a bunch of follow-up questions about tapping for weight management. Welcome to Thursday Therapy where I answer your questions on the psychology of eating, movement, weight and body image every two weeks. Guys, with all the new research coming out on tapping for weight management and with the launch of our next online tapping for weight management program, I’ve been answering a lot of questions on tapping for weight management, so I thought I’d answer some follow-up questions from our first video. Now guys, this video will be for people who know a bit about tapping, so if tapping is completely new to you I want you to go and watch one of our other Thursday Therapy videos, which will provide a link to, and also check out our tapping for weight management online program. There’s a lot of videos in there, some links to research and a lot of other material that’ll help you get all schooled up but for now let’s get to answering the first question that comes from, Simon. Simon asks, “Tapping is great and I’ve tapped away a desire for beer and chocolate but can tapping be used to increase desire for nutritious foods like fruit and veggies?” This is a great question, Simon and it’s one that we get all of the time. Thank goodness, the answer is absolutely, yes! In our online program for weight management we spend the first week teaching you about tapping for weight management then we spend the second week tapping away the desire for less nutritious foods which it sounds like you’ve already done and that’s what tapping is really well known for at the moment but then in the very next module we go a step further and tap to increase the desire for nutritious foods. So, remember with tapping, what we’re doing is we’re focusing on a problem and then we’re clearing it by tapping on the acupressure points, so we apply that same process just to the problem of a lack of interest or even a dislike for less nutritious foods. I am not the biggest fan of cooking and eating chicken, so I’m going to go out to the kitchen and do some tapping on chicken just as an example of how it might work. Okay, so I’m here with my chicken, which is something that I consider nutritious, it’s you know, a lean protein but it would be my least favourite thing to cook. So, I’m going to show you how I would do a bit of tapping on my resistance to cooking chicken, even though I don’t really want to cook this chicken. I love and accept myself even though it just takes too long to cook, I love and accept myself even though it doesn’t really taste that great, it’s kind of bland, I’d much rather something else, even when I do cook it, I completely love and accept myself, this resistance to cooking chicken always takes too long and I’m no good at it, I always end up under cooking it which means I’ve got to cut it up and then cook the little bits or I end up overcooking it. Steak is so much faster and it’s so much easier, all of this resistance in my brain and body towards cooking this chicken. So, I hope that really helps, Simon and we know what I’m going to be eating for dinner tonight. Let’s move on to our next question from, Lou, who’s also got part way with seeing the benefits from tapping. Lou asks, “I know you recommend the EFT and I’ve successfully used it to tap away a number of food cravings but I’ve realized that I just keep replacing one sugar / chocolate craving with something else that provides me with a sugar or chocolate fix. I’d prefer it if I just didn’t have that need, it seems better than it used to be but I go back to my old ways when I’m tired, stressed or PMSing.” Thank you for your question, Lou. I’m really glad you asked this one because this is one that a lot of people struggle with, so remember in tapping we think of the problem as being like a puzzle and like any puzzle it’s got lots of pieces, so it sounds like, Lou you’ve done a really good job to tap on the food elements of the puzzle you know that the tastes, the textures, the smells but then there’s this other element of the puzzle that you haven’t quite tapped away yet. For you that’s the tiredness, the stress, the PMSing and while this all has a bit of a physiological component, it’s also very, very emotional. So, what I’d encourage you to do is to go back and then tap on those base emotions, those pieces of the puzzle that are maintaining your cravings. Emotions, guys, they’re massive. Some research shows that up to 70 percent of your non-hungry food cravings, they’re emotionally based and that’s why in our tapping program it’s actually the biggest module we do. We spend two weeks on tapping through all of the emotions and we’ve even included extra videos in our advanced program to help you tap through the whole variety of emotions that can maintain your food cravings. So, psychologist, we call these emotions, maintaining factors, as long as they’re there they sort of maintain the issue, so if you tap them away you’ll get a much more pervasive and a much more lasting benefit. Let’s get to answering the last question which comes from, Michelle. “The Thursday Therapy question that I have today piggybacks off of one previous video about food intolerance and intuitive eating and the question that comes up a lot for my clients is that they know what foods are “offending” foods or cause them distress or other types of issues, but as Glenn describes, that rebellious 17-year-old still wants to eat them. So, what I want to know is what you’d suggest in cases like that? I look forward to your answer. Thanks Glenn. Bye bye.” So, great question Michelle and it is one that we get quite a bit. Michelle, I know that we are kindred spirits in the size diversity, intuitive eating, tapping kind of a space and guys actually, I’m going to provide you a link to Michelle’s work, she’s written some really good blogs that she shared with us in our online support group and people have really loved them, so definitely check her out. But Michelle to answer your question, when Michelle emailed us, she wrote is this way you’d recommend tapping or hypnosis and the answer is absolutely yes, so with the hypnosis, we’ll provide a link to a video that I’ve previously done on hypnotherapy, so you can see what it is, what it isn’t but this is a great area to target for hypnosis with a trusted health professional and I would definitely do that with a qualified hypnotherapist and probably be doing this kind of work one-on-one. Similarly, with the tapping, I won’t do any tapping with you on this area, in this space of time, but in our advanced online tapping program because you asked for it, we do get a lot of people who experience these issues, we actually do a whole module on resistance to change, that inner rebellion, knowing that being healthy is good for you but not feeling like you want to do it, so that’s definitely something that you can do tapping for. If you do feel comfortable enough in yourself and in your own tapping to go there yourself, try and identify what exactly it is, what is the exact barrier is it, I don’t want to be healthy because my doctor told me I should be or I don’t want to be healthy because it reminds me of when someone told me I wasn’t good enough if I was healthy or you know what I just feel like it’s too much effort, so stuff it I don’t want to tap, trying to identify what the issue all the issues are and tap on them. Guys, I hope that answered some of your questions and tapping is one of those things that you can get a really quick benefit from it in a really short period of time and I can do it in a workshop of a hundred people in an hour workshop and people get a benefit out of it without knowing too much about it or it can be one of those things that you can just delve more and more into and get better at the tapping techniques and get better and applying it to all areas of your life, really go right down the rabbit hole and get a really deep, lasting and pervasive benefit. So, guys, having said all of that, I really want to invite everyone to join our online tapping for weight management program, the next round starts July 3rd, so it’s just a few days and we’re really, really excited about it. There’s some really fantastic new research coming out on tapping for weight management including Peters research showing that the brain actually changes when we tap on food cravings and researchers in publications showing this very program that we do is the first clinically proven online tapping for weight program, an improvement in all variables, one year post doing the program. So, they’re the sort of things that you could likely expect if you were to do the program but we’re never ones to rest on our laurels, so the program is new and improved, we’ve kind of jam packed it full of extra videos, blogs and free downloads and the biggest thing is we’ve got an option to do the advanced program, turning the program from an eight-week program into a 12-week program for people who want to tap a little deeper on some underlying issues and for people who struggle sometimes to get longer-term results because they feel like they need to do a bit more work. The program is absolutely fantastic and it’s the only place where you can get support one-on-one from Peter and myself around the tapping, so we would absolutely love to have you along and of course for you guys will always give you our GMACK discount code, we’d love to have you along tapping with us. So, until then, happy tapping and I will see you in the next Thursday Therapy. Hey Buddy!, I found this information for you: "EPISODE 33 Answering your questions on tapping for weight". Here is the website link: https://www.weightmanagementpsychology.com.au/episode-33-answering-your-questions-on-tapping-for-weight/. Thank you.